We get this question a lot and there are several answers, but we’ll start with the most apparent and disappointing one – Builders only build to minimum code and don’t care about energy bills unless they live in the home themselves. That’s right, because a home builder will never pay an energy bill of a home they build, why would they do anything more than the minimum required amount of attic insulation? IRC stands for, International Residential Code. The IRC is a comprehensive, stand-alone residential code that creates minimum regulations for one- and two-family dwellings of three stories or less. It brings together all building, plumbing, mechanical, fuel gas, energy and electrical provisions for one- and two-family residences. Every three years revisions are made to the IRC and codes can alter and differ from previous versions, but for the most part they remain about the same. There is also an IECC compliance guide, or International Energy Conservation Code, for builders and sub-contractors that are mostly just recommendations as opposed to requirements to assemble various aspects of a home. Anything more than minimum code expectations is not desirable to the builder, since any extra expense incurred by going above and beyond code is usually not recouped in the sale, thus limiting profits, hence it isn’t done above minimum code requirements from the IRC or recommendations from the IECC. This is known as spec home building, or a speculative venture for the builder, meaning the home was built with the intention of selling it for a profit, as-is or with minimal changes from code and basic design. Spec houses are plentiful when the economy is healthy because builders can sell them quickly and use the profits to build more. That said, builders want to build homes for as cheap as possible and sell them fast. One area to not go above and beyond, and an area that impacts your energy costs most, is the attic insulation. 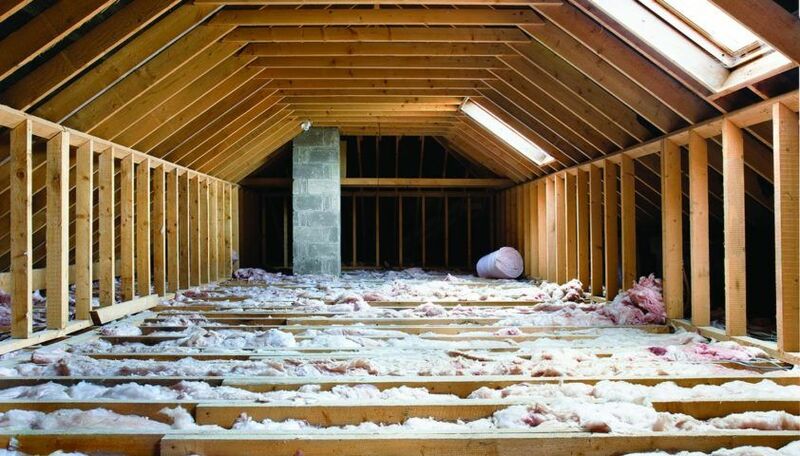 Attic insulation codes will vary by region and climate, but in Kansas City and the surrounding area, IRC code and IECC guidelines require an R-value minimum level of anywhere from R-19 to R-38, which is still below the U.S. Department of Energy’s optimal recommendation of R-60 today… well below, in fact. So, reality is this; builders built your home with the intention of meeting minimum requirements and reducing costs to turn the most profit possible. Yay capitalism! Good for them, not good for your energy costs. Since they will never pay a gas or electric bill for your home, they don’t mind only meeting minimum requirements for insulation, the largest energy loss space of your home. The good news is, you can solve the problem, save on energy costs, and have it done for less than you may think! In fact, most circumstances allow for adding attic insulation to an R-60 and saving up to 30% on energy bills each month… immediately! This means your investment pays for itself over time. Once adding insulation pays for itself, it actually makes you money compared to your previous energy costs. It’s a no brainer to invest in adding attic insulation and clear why your home is under insulated. Get in touch with us today to schedule your free energy inspection, know where your R-Value stacks up compared to DOE recommendations, and start spending less and living in the comfort you deserve.